The 1 year Pre-Med is a unique programme taught on the Crewe campus leading to a Certificate of Higher Education (CertHE.) in Medical Science qualification. The Pre-Med has been developed for students that wish to enhance their application to medical or dental school and simultaneously complete the first stage of our accelerated 2-year BSc(Hons.) degree. 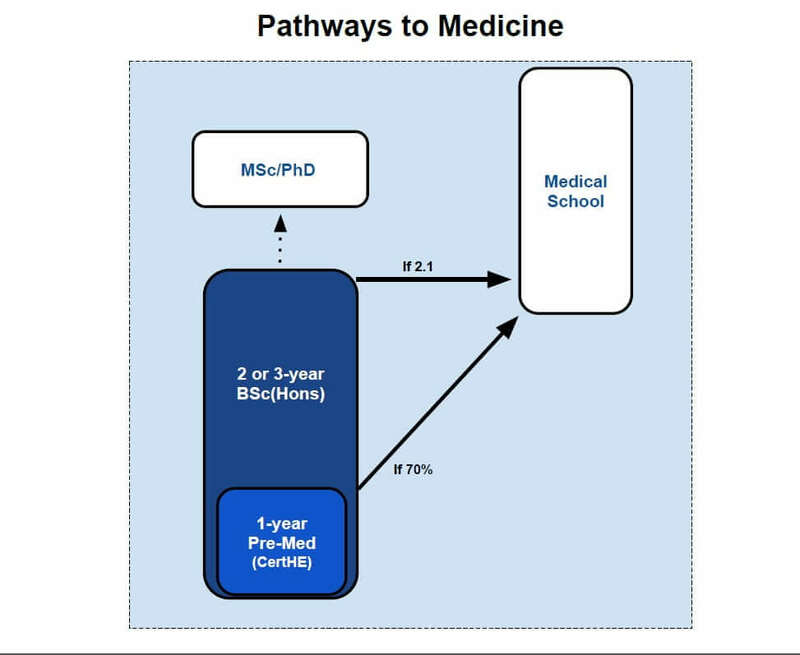 Why is this Pre-Med programme unique? Core modules are taught from a clinical perspective which provides students with the theory and experience found among first-year courses at medical or dental school. Students who achieve, or are predicted, at least 70% on all modules of this course will usually meet the academic criteria for some medical schools in the UK. Other non-academic entry criteria must also be met. Applicants who have achieved, or predicted, at least 70% on the 1-year Pre-Med will be guaranteed an invitation to the second phase of the University of Buckingham MB ChB Selection Process – MMI. Applicants will also be required to have grade C in English GCSE, or if English is not their first language an IELTS of 7.5 with a minimum of 7.0 in each component. The course also forms the first stage of our unique 2 year BSc, for students who wish to apply for medicine or dentistry as a graduate, pursue their scientific career further or go into employment. Each applicant is considered on a case-by-case basis, and an interview may be required. A-Level grades of BBC to include Biology and Chemistry (or equivalent e.g. IB score) are normally our standard requirements for entry. 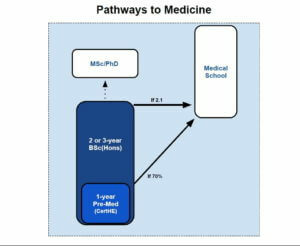 Students who have passed an approved medical/biomedical foundation are strongly considered for a place. Students can progress onto the second and final year of our 2-year Biomedical Sciences degree. Successful students who do not apply or secure a place into a medical school can progress onto the second and final year of our 2-year Biomedical Sciences degree. Students who then achieve at least a 2.1 will then have have a high chance of securing a place at medical or dental school.